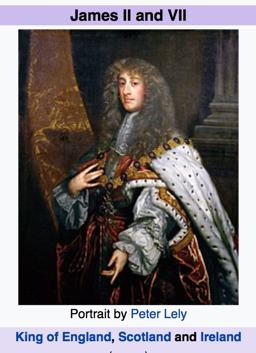 James II and VII (14 October 16 � 16 September 1701) was King of England and Ireland as James II and King of Scotland as James VII, from 6 February 1685 until he was deposed in the Glorious Revolution of 1688. He was the last Roman Catholic monarch of England, Scotland and Ireland. The second surviving son of Charles I, he ascended the throne upon the death of his brother, Charles II. Members of Britain's Protestant political elite increasingly suspected him of being pro-French and pro-Catholic and of having designs on becoming an absolute monarch. When he produced a Catholic heir, a son called James Francis Edward, leading nobles called on his Protestant son-in-law and nephew William III of Orange to land an invasion army from the Dutch Republic, which he did in the Glorious Revolution of 1688. James fled England (and thus was held to have abdicated). He was replaced by his eldest, Protestant daughter Mary II and her husband, William III. James made one serious attempt to recover his crowns from William and Mary when he landed in Ireland in 1689. After the defeat of the Jacobite forces by the Williamites at the Battle of the Boyne in July 1690, James returned to France. He lived out the rest of his life as a pretender at a court sponsored by his cousin and ally, King Louis XIV. James was deposed in 1688, and died from a cerebral hemorrhage in1701. "James stood in dark contrast to his predecessor, Charles: James, although valiant in battle until his later years, lacked his brother's good nature, and remained a staunch adherent to the Roman Catholic faith. His accession was greeted with enthusiasm; Charles had leftJames a strong executive office and a loyal Tory-dominated Parliament.James, however, acted recklessly attempting to restore royal prerogative and turn England back to the Catholic faith, costing him the crown. "Religion and politics were intertwined throughout James' public life. He openly opposed the Test Act of 1673, which barred all Catholics andDissenters from holding administrative positions; James relinquished the post of Lord High Admiral and went abroad. The Whig Parliament of1679 strove to exclude James from the succession, and failed only because Charles II dissolved Parliament. Within months of his accession, James had to crush a rebellion of Protestants who rallied around his nephew James, Duke of Monmouth and son of Charles II. The Protestants were easily defeated, and James exhibited little toleration: Monmouth was captured and beheaded. James appointed JudgeJeffries to preside over the "Bloody Assizes" which executed ,tortured, or sent into slavery the Protestant rebels. James ambitiously appointed Catholics to high positions although loyal Tory councilors advised against it. As a result, both Tories and Whigs turned against him. "Within three years, both the old nobility and emerging commercial class had been totally alienated by James. Mary of Modena gave birth to a male heir, James Francis Edward, which interfered with Parliament's wish that James' Protestant daughter, Mary, would succeed to the throne upon the death of her father. Protestant members of Parliament, thoroughly disgusted with James, invited Mary and her husband, William of Orange, to take the throne. James, haunted by recollections of Richard II and Henry IV, chose to flee London rather than be captured. James was captured, but William ensured a successful flight to France for James. James garnered Irish forces (which were supported by French troops provided by Louis IX), but was defeated by William's forces. James lived the remainder of his life in France. "James' attempts to force Catholicism on England and regain prerogative doomed his reign. Parliament emerged supreme: royal lineage was still a major consideration, but Protestantism became the main factor in choosing a monarch - a decision now left to Parliament. Bishop Burnet offered a glimpse of James II's character in History of his Own Time: "He was naturally candid and sincere, and a firm friend, till affairs and his religion wore out all his first principles and inclinations."